This is a great sounding effect by Dave Barber, modified to put the Sub Bass pot external. Dave sells effects at great prices and their build quality is second to none, so this is one of those builders that everyone should support where possible. So if you get an opportunity to buy any of his other effects at any time then do it, you won't be disappointed. Extremely versatile, high gain distortion, provides wider range of stellar tones. From ultra chunky, to scooped and back to thick again. Toggle switch selects mid range character for three distinct modes. Sweet and powerful Vintage two band E.Q. Internal adjustable Bass Boost for powerful sub frequencies. True bypass footswitch delivers clarity when bypassed. 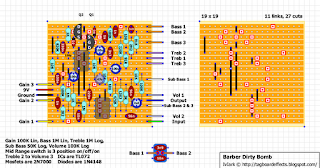 All hand wired in the USA, traditional award winning Barber layout and wiring. Cascading FET circuit, with MOSFET distortion for incredibly realistic tube quality sounds. i built one of these using another vero layout and it's an awesome pedal. i kinda wish i would've waited for Mark's layout since his are smaller and use lay down resistors but i love the pedal just the same. It is so awesome that you post the BOM now! Can't believe how responsive you are to user-suggestions. I've always been able to, I just didn't think the BOM created by the software was particularly good. It doesn't group same values and nor does it put them in the right order so it always seemed pointless to include to me because it would need to be re-interpreted into a useful format in exactly the same way as the graphical layout would. But as a few people have asked for it I wrote a macro in Excel to create the BOM for me from the less useful output so I can do it in a couple of seconds instead of having to do it all manually. I probably won't include the BOM for simple and low parts countbuilds, but I will for larger ones like this. i'm really surprised that no one has built this and verified it yet. it's a great sounding pedal! like i said ealier, i would've used Mark's layout but i built mine right before he posted it. The "problem" (if we can call this way) for me, is that this is a real cheap pedal, around 100€ or about 50 if second hand. I prefer to pay 50 euros in a second hand one, that spending about 15 in components, box, jacks and so on, and take 3 or 4 hours of working building it. 100 euros i think is a fair price for both builder and buyer, so I don't even think about cloning a pedal of this price range. I just try to clone the pedals / effects than I cannot (or prefer not) afford or models out of production. Surely this effect is great, but would build about 40 different ones previously. i can understand that, but i use my pedals with a bass, so cloning them works out much better for me since i can socket some of the components form the start and tailor the tone more to my liking. I, too, use my pedals with a bass. John, did you do any special bass-friendly mods to this that you would be willing to share? I have built a few of your modded vero layouts and they all really work well for me. Thanks! I don't think that I modded this one for bass, but I might have. I'm building it, about 3/4 of the way done - the board is done, just wiring up the pots/switch. should be verified in the next couple of days, i'll let you know! Allow me to verify this layout - my build is complete, and works fine. Nice high gain, lots of room to move, very organic sounding. Got 'War Pigs' right away with it (FNM version). Still playing with it. Not as high gain as mesa.. still halfway though my dr.boogie build, gotta finish that next. Can someone please explain where the mids toggle switch goes? 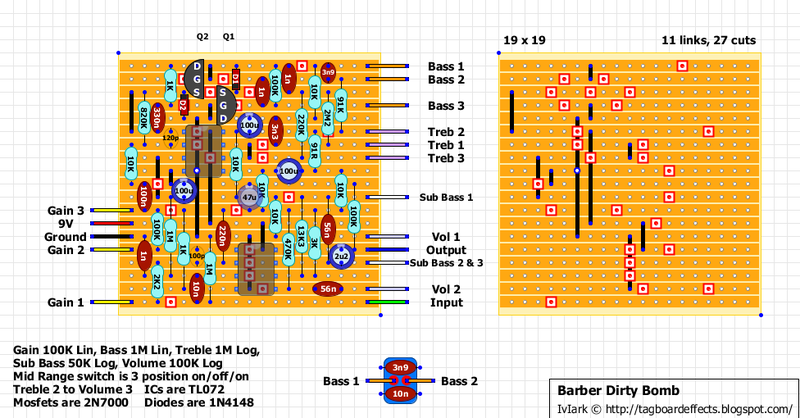 Also how do I wire the external mini circuit (in the diagram Bass 1, Bass 2 with 3n9 and 10n)? I am confused so sorry if I asked any silly question. The caps are soldered across the top and bottom lugs shown and then the two middle lugs (2 and 5) are soldered to the Bass pot, lugs 1 and 2.
built this the other night for a friend. sounds awesome and the external sub bass knob is a nice bonus. I was wondering if you could do the Barber Trifecta? I've loved the sound of it forever. I'm confused about the jumpers. It says that there are "11," but my eyes are clearly counting "10." The 4th jumper from the left has an odd "dot" in the 9th hold down from the top of the board, so perhaps that is meant to mean that there are actually 2, rather than 1 jumper there, but if that's the case, where are those ends by the "dot" supposed to connect, because if they connect at the dot, it's one jumper, not 2. The link with that blue/white dot on it is indeed two links, the blue/white dot indicates that they end in the same hole. So basically you have a link spanning 6 rows and a separate one spanning 5 rows but they start/end in the same hole. Hope that makes sense. Ok, I get it. Thanks! Onward with the build! Just finished building this, sounds amazing, thank you for the layout! I would like to tame the gain a little bit, as i want to use the low gain side of the pedal more than the heavy distortion. Very elementary question (like my skills! ), but could anyone tell me how i could achieve that? Would i need to decrease the gain pot value, or would i have to switch some values on the board? Anyone that can fit this into a 1590A gets $200 from me. would replacing the mid switch with a pot and taking a lower value for the first and higher for the second capacitor make it a wider midcontrol or just making it worse? Very frustrated I am... I just built this up and all I get is a clean pass through signal. I have checked and checked again...just clean with or without power...totally confused. Aaaaaarrrrgghhh! Thanks, I'll check voltages....every track is clear and I'm SURE the placements are correct. Weird thing is is that with the grounds of the guitar input and out connected I get a clean signal. When they are both grounded to the neg battery input the whole thing is silent...maybe that's as it should be? Are you're sure you're wiring ground to the sleeve and not the tip? Lol...just built this AGAIN, QUADRUPLE checked tracks, placements and components. I now get output but it's fairly low level, screechy and squealing. I get some overdrive with the gain fully up but with the gain pot down it fades the signal out like a volume pot. When first powered up and a note played the screechy, squealing noise is less but you can hear it start to build up over a second or so, it's then there the whole time. The overdrive/distortion effect is moderate at best. The tone controls "seem" to have some effect as does the volume. Without the upper left hand chip in (as per the layout above) the unit is MUCH louder and less screechy but only a gentle overdrive effect. Gain pot works a little better. With both chips in the gain and drive is waaaaay down. Sorry to be a real pain but could one of you more experienced folks cast an eye over those voltages? I'd really love to get this pedal up to speed but I really am at the limit of my ability here. Thanks very much! Pin 4 and 8 are ground and supply and they look good on both pedals. Pins 1 to 3 on the top IC look fine as you would expect, but all the other opamp channels look off. You shouldn't have anything approaching the supply voltage on pins 1 to 3 or 5 to 7 on both ICs, so all those need checking. Pin 5 of the top IC is a very curious voltage, because it's next to the ground pin (4) and with no cut in between and so should also be 0V, but you're showing 8.88V. Pin 5 of the lower IC has a 470K connected to it, and the top of that 470K is on a vref rail and so should be around 4.4V. But you're getting 7.6V fluctuating on that. That makes me suspect one of the 10K resistors on the same row as the top of the 470K may be incorrect values or not soldered properly. Anyway you've obviously got a few areas you need to go over with a fine tooth comb to look for mistakes, bad soldering, incomplete cuts etc. You want to be aiming for around 4.4V on all the pins 1 to 3 and 5 to 7, so that should give you a guide if you fix something with your probings. Right, out come the component selection, soldering iron, de soldering wick and muti-meter. Wish me luck....I hate/love this. Found I had used an 820R resistor rather than an 820k! Now I have volume, gain up the wahzoo and gain control. Pins 6-8 on the upper ic is still the same, near supply. Is this a deal breaker or am I getting less from the sound than I might have! What do you guys think? Can't beleive i missed this one. Built it and it rocks!